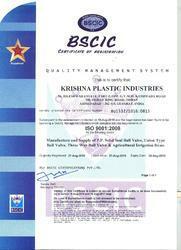 Established in the year 1995, we 'Krishna Plastic Industries' are a reputed Manufacturer, Exporter And Trader of IUPVC Valves, PP Ball Valves, Plastic Ball Valve and much more. The entire range of our products is Agriculture Ball Valves, Three Way Valves, Irrigation Ball Valves and Drip Valves. The offered products are manufactured using the best grade raw material and sophisticated technology in strict adherence to the universal norms. In addition to this, our products are available in various sizes, shapes, finishes, polish and other related specifications for our esteemed patrons. Clients can avail the offered range from us at the most affordable rates. All our products are offered under the brand name “PAYAL”. We have a well developed state-of-the-art infrastructure which is spread over a large area. The entire manufacturing unit well equipped with all the modern machinery, tools and equipment that help in producing a quality assured the range of products. The dexterous professionals appointed by us make sure that only quality-assured products are offered to the clients within the stipulated time-period. In addition, we examine the quality of products offered by conducting a series of tests to examine the flawlessness before the final dispatch. Under the proficient guidance of our Owner, Mr. Mansukh Patel, we are able to attain the maximum level of satisfaction of our clients. His excellent business skills, motivating persona, and fascinating business decisions have helped us in gaining an edge over the others in this competitive market. Manufacturing, Trading, Importer & Exporter of Industrial Valves & Flanges. We are backed by a team of competent professionals, which helps us in catering the variegated needs of the clients by providing them with an excellent range of Industrial Valves and Flanges. The professionals of our organization hold in-depth, vast experience and immense expertise of every aspect of their respective domains. Our experts work in close equilibrium with each other to achieve the goals of the organization in an efficient and effective manner. Since our inception, we have been able to create a benchmark of success in the market due to premium quality and attractive features of our products. Our ethical dealings and fair practices of the trade has enabled us to win the confidence of a large number of customers throughout the world. Apart from these, there are varied other crucial factors that are considered to be of utmost importance behind the enormous growth and success of our firm. We have garnered a lot of trusts and immense appreciation from our clients to offer the high standard quality of valves and fitting products.